One of the things that I find so unique to Second Life is the sense of community that you find in certain places. So many of the folks who create in SL are not here to make a buck, because they read you can be an instant millionaire in Business Week. One of the ways that the SL residents give back to the community is in the form of that favorite of all, the freebie. Because of the sacred nature of the freebie gift to the community, there's one category of resident that is reviled as the most repellant of all the shady characters in SL , the lowest of the low - the freebie reseller. I shiver to think on it. Fortunately, these low-lifes are few and far between. Those who value community and still make and distribute freebies to the world are wonderful people, and I hope to recognize some of them regularly. 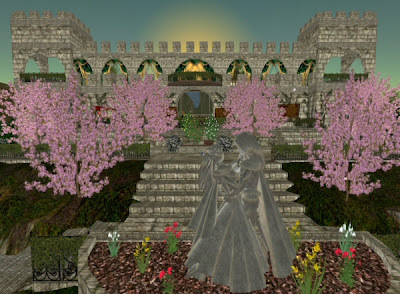 One such is the community of Avilion, a medieval community with an Elven flair that has three RPG sims called Avilion Mist, Avilion Isle, and Avilion Grove. The builds there are deliciously ornate, lush, and inviting. They have a spectacular ballroom that just has to be seen to be appreciated. And it's all free. 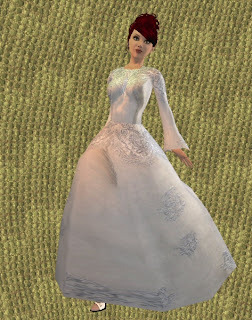 During one of my many visits to the Avilion sims, I stumbled across a freebie box of Elven gowns. Being a freebie maven, I of course snagged one, and found that they were quite nice indeed! Simple garments with lovely textures, that immediately bring one into character in the medieval setting. Created by Oracle Stonebender, they're a generous addition to the freebie offerings in Second Life. 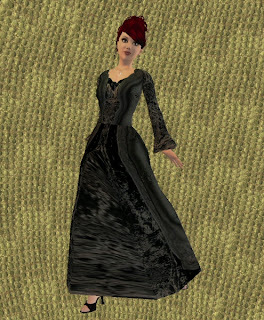 The gowns come in many colors, this midnight blue, a forest green, a shiny silver, and this rich black. There's even a pants option in the silver tapestry texture, and all the garments are copy/mod/transfer, in true orthodox freebie tradition. My personal favorite is the silver tapestry gown - I just love the rich textures on the fabric and it has a lovely glow to it. 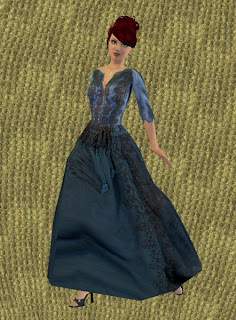 Dance the night away in this freebie elven gown. It's magical.